The Victoria and Alfred (V&A) Waterfront is a major South-African tourist attraction that draws over 23 million visitors per year. 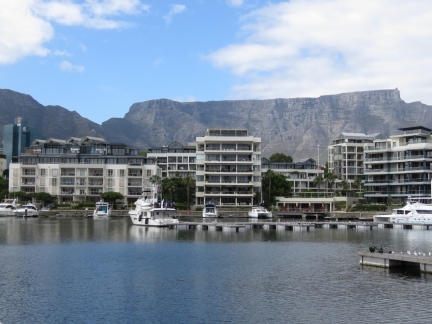 The property was transformed from a largely derelic and underutlized commercial wharf and storage area in the 1970s to a fabulous selection of restaurants, shops and tourist venues, plus condos and hotels while remaining a working waterfont. 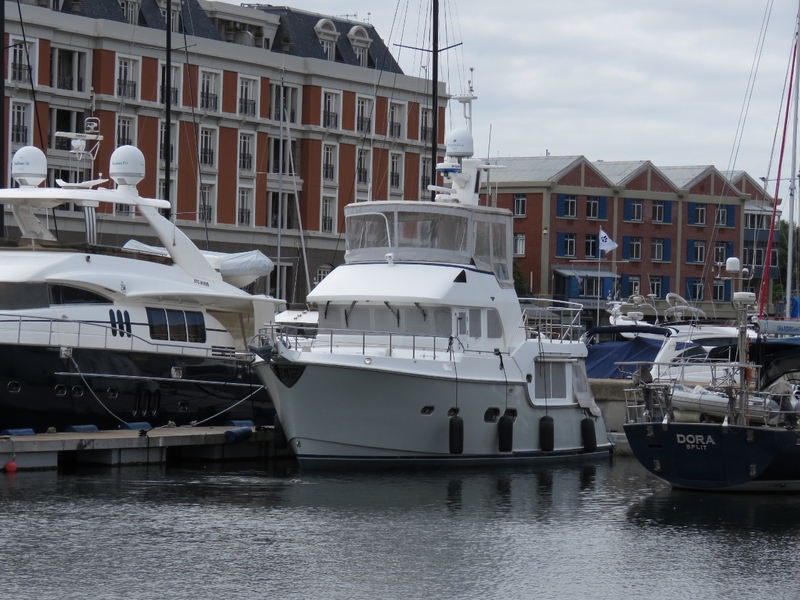 Also included in the development was the beautiful V&A Waterfront Marina, where we are moored within easy walking distance of all the attractions. 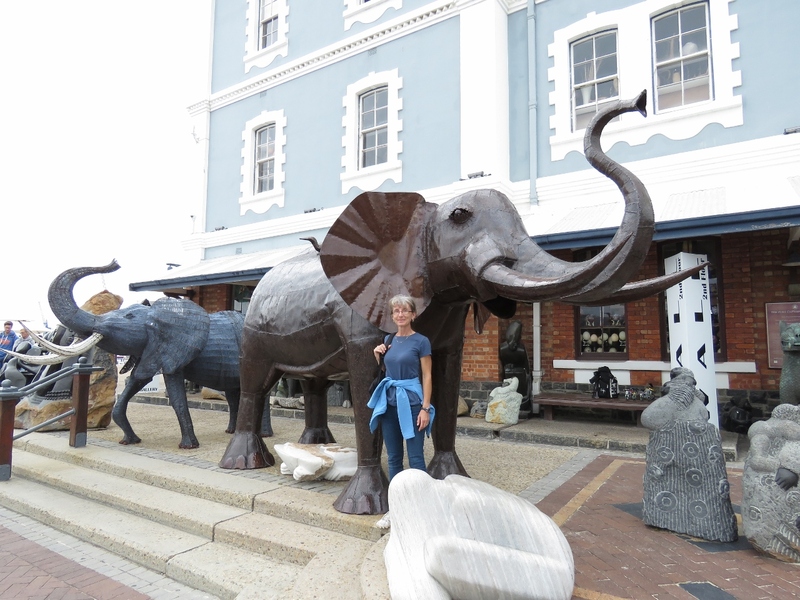 We spent our first couple of days in Cape Town exploring the V&A Waterfront and enjoying some excellent meals. 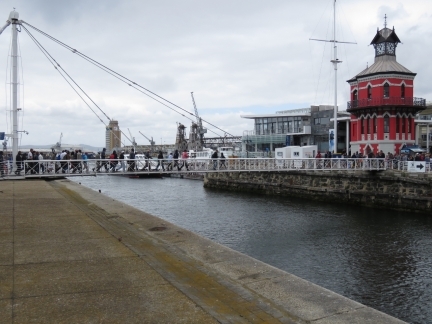 The marina basin was built in the 1800s and later converted into the V&A waterfront complex. 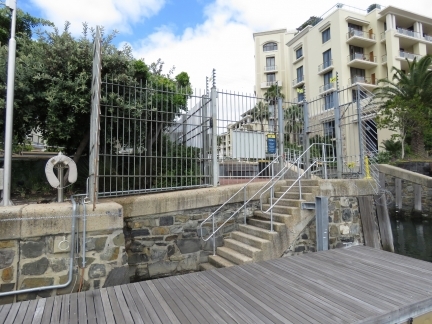 These might be original steps that lead ashore from our dock. It’s a little unusual for a dock to be accessible only through stairs–hopefully we won’t need to transport anything heavy or wheeled. 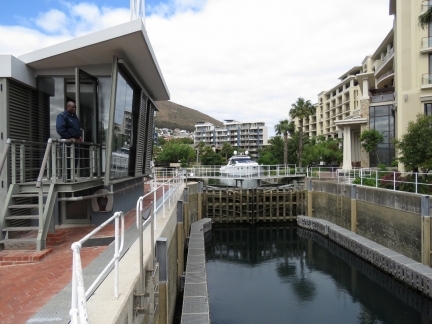 This small lock leads to a canal between residential buildings behind the marina basin. 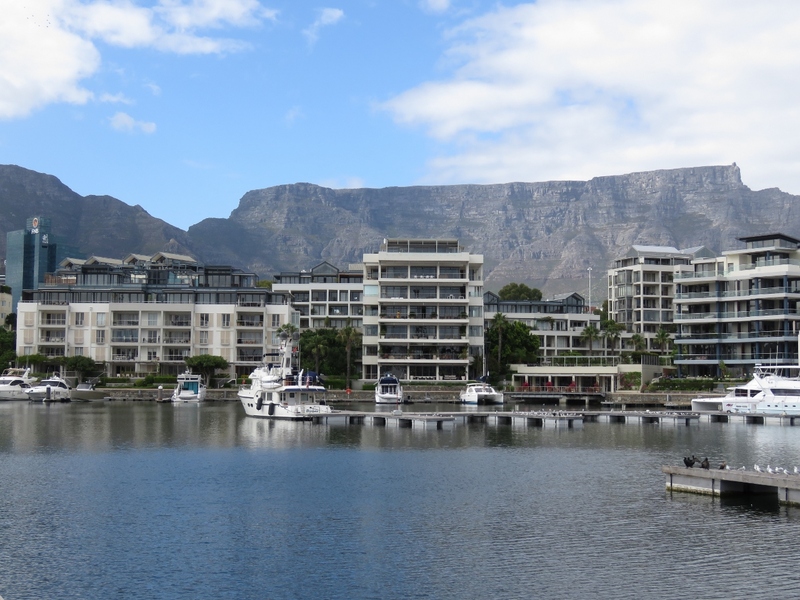 Our slip at the V&A Waterfront Marina with dramatic Table Mountain as a backdrop. 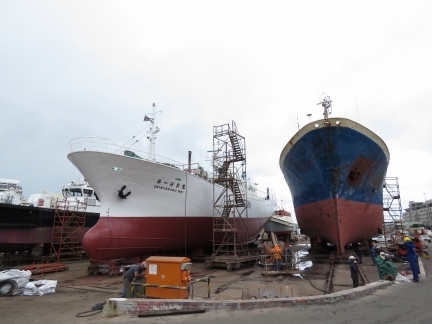 The dock mostly is empty now, but will fill up when the World ARC fleet arrives in December. The V&A Waterfront Marina is home port to Nordhavn 5261. 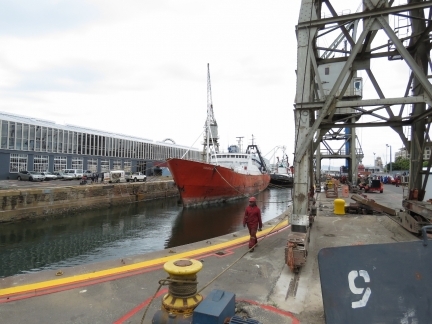 We know many South African Nordhavn owners, but as far as we know this is the only Nordhavn that is actually moored long-term in South Africa. 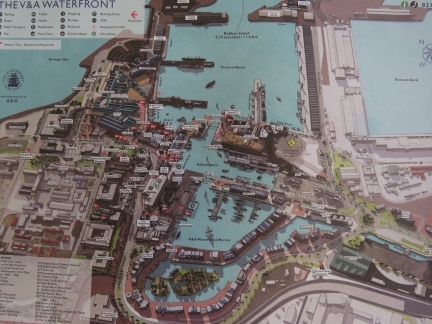 When we checked in at the marina office, they gave us a couple of maps of the area. 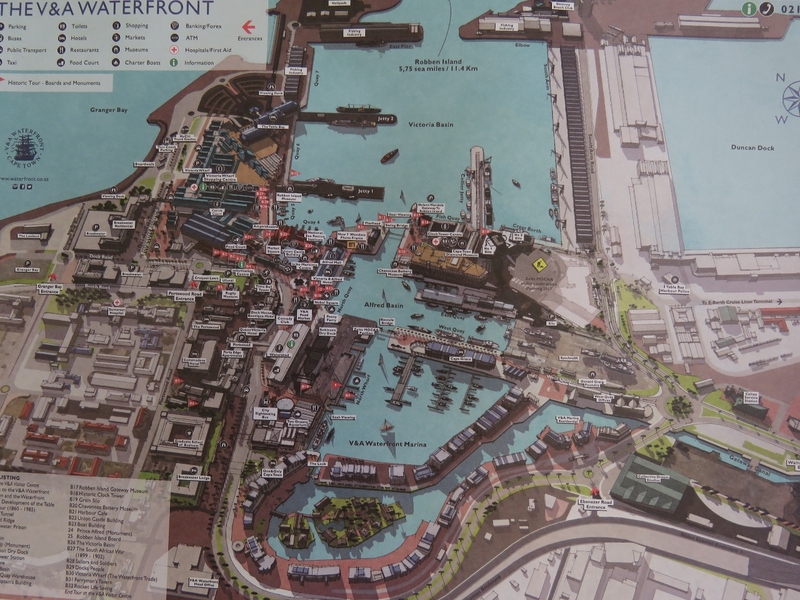 This shows the V&A Waterfront complex which is full of shops and restaurants. The Robinson Dry Dock was built in 1882 and is the oldest operating dry dock of its kind in the world. Two large ships had just entered and a crew was closing the gate as we passed by. 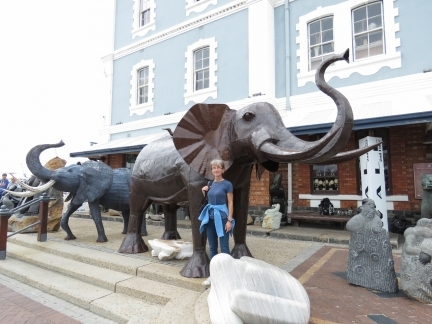 Some fabulous, and huge, sculptures for sale along the waterfront. 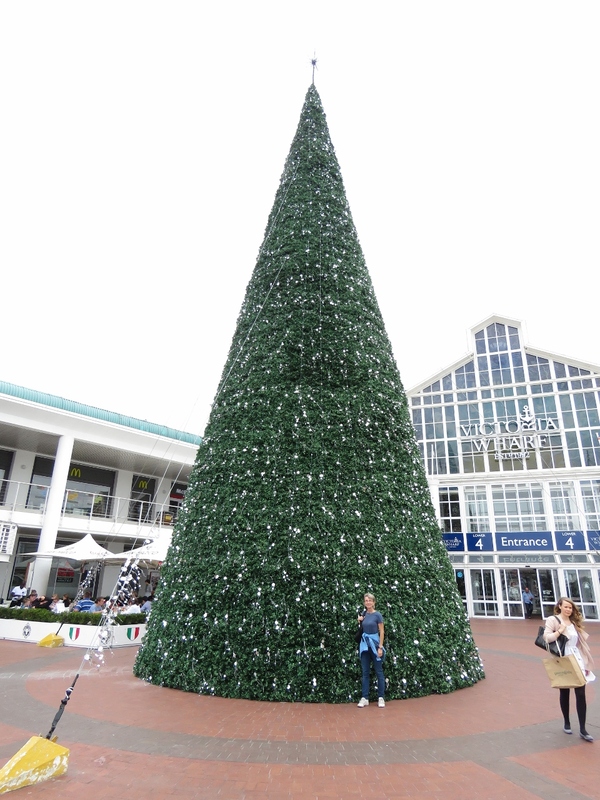 A year ago we took a picture of Jennifer by Sydney’s Happy Christmas tree. This year, with temperatures in the 60s, we’re getting closer to Northern Hemisphere Christmas weather. Looking southeast across Victoria Basin. A view to the Atlantic Ocean at Granger Bay. 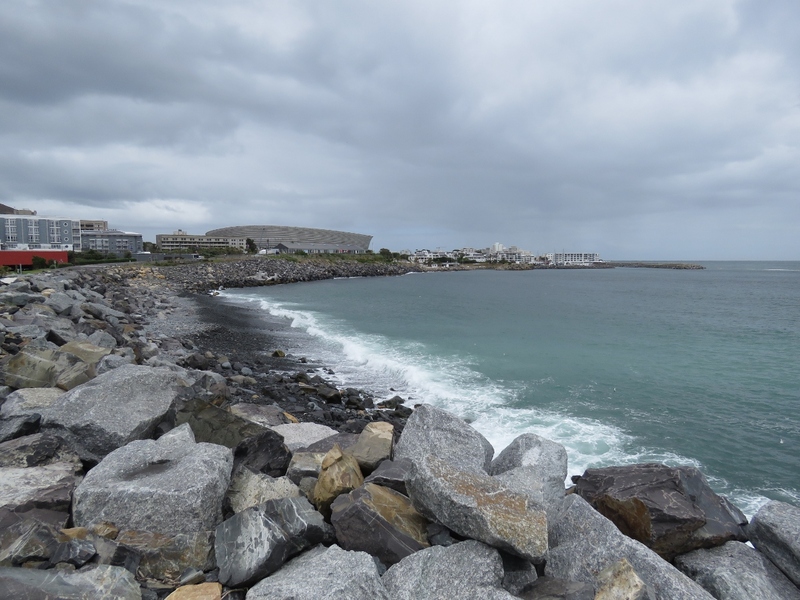 This looks like a great place for storm-watching. 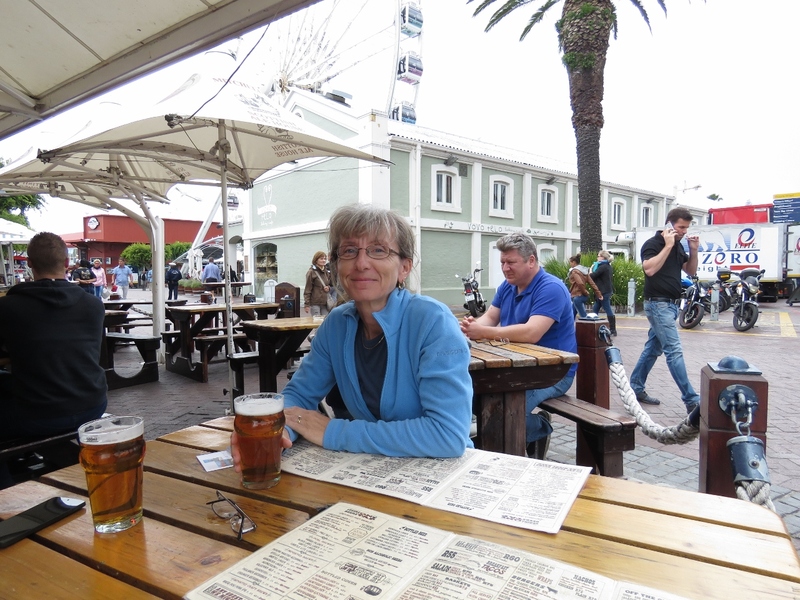 We had tasty pub fare for lunch on the patio at Mitchell’s Scottish Ale House. Like all the other port cities we’ve visited in South Africa, Cape Town has a capable-looking Sea Rescue station. But this one also sells souvenir T-shirts. 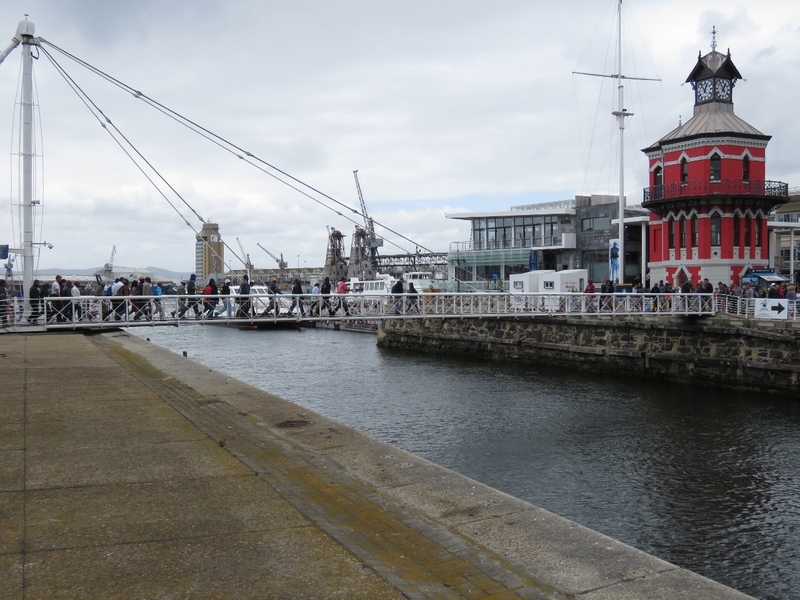 The Swing Bridge was the first of the two bridges we passed to enter the marina. 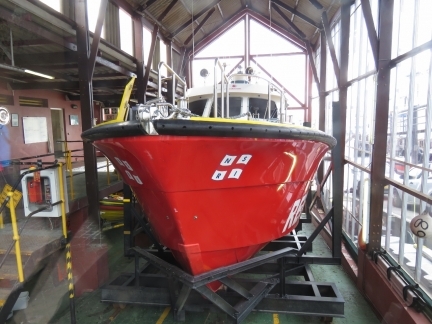 Several large commercial boats were hauled out across the water. 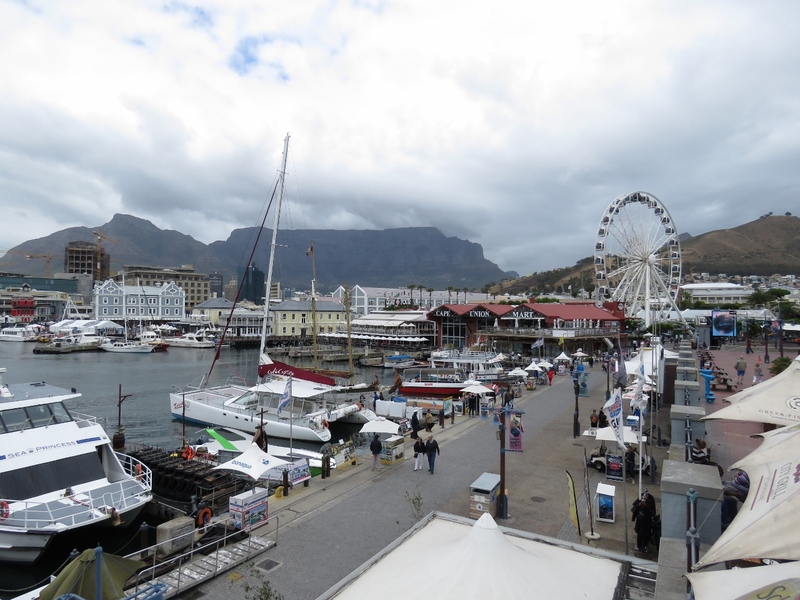 Cape Town Harbour is very much a working waterfront. 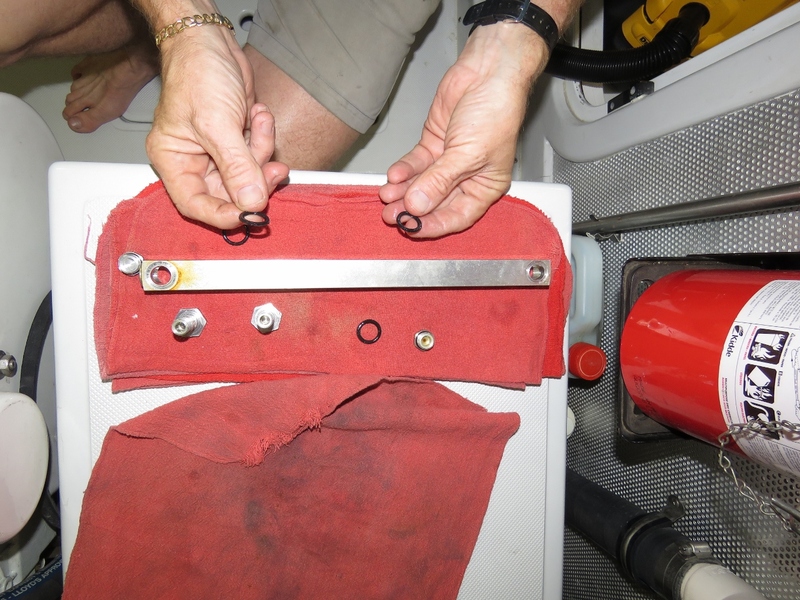 On investigating a fuel leak at the wing engine tank James found the o-rings in the sight gauges needed replacing. That metal bar on the rag is the sight gauge itself. The sight gauge for the wing engine fuel tank was easy enough to remove and since it was leaking due to a tired o-ring, James replaced the o-rings in all the sight gauges. 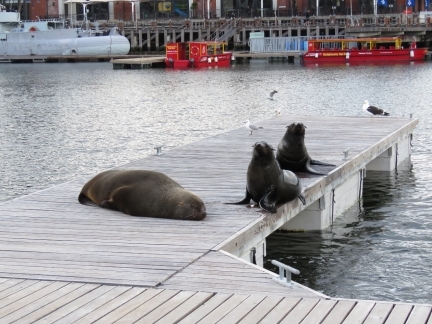 South African Fur Seals are abundant in Cape Town Harbour. This male and two females hauled out on the dock behind Dirona. 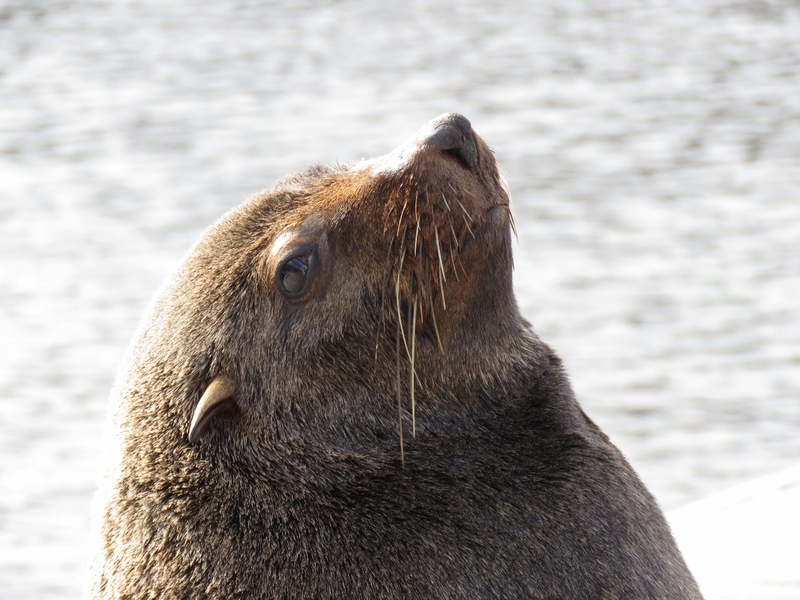 A close-up view of the male fur seal on the dock behind the boat, only a couple of yards away from James as he takes the picture. 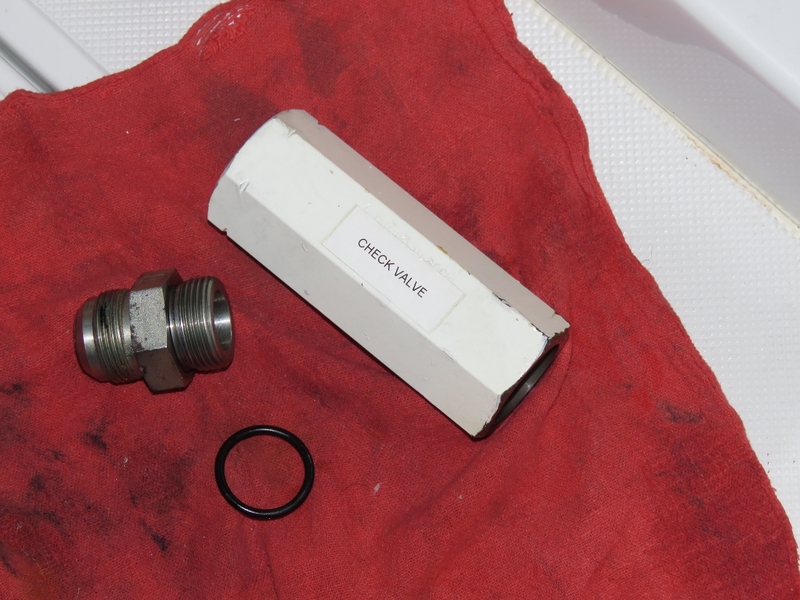 A minor hydraulics leak at the wing engine check valve. 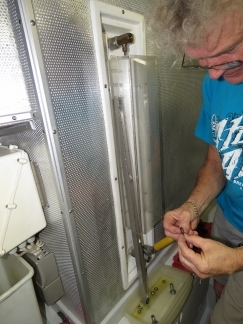 This was just barely enough of a leak to wet the hose on the outside, but not run to the bilge, so it’s pretty minor. Nonetheless, hydraulic leaks don’t get better so we aim to have all joints dry and dusty. 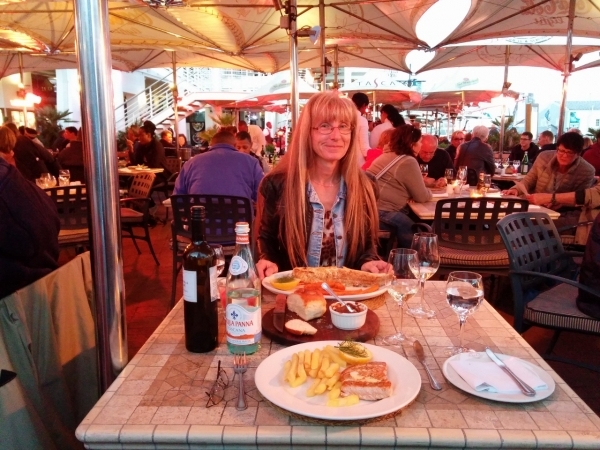 A delicious whole baby Kingklip for Jennifer on the patio at Belthazar. We’re taking full advantage of the high quality and excellent prices at the wide variety of V&A Waterfront restaurants. Dinner for two with a good bottle of wine runs about $70 US. Looks like you’ve both been having a splendid time. Trust your Thanksgiving was wonderful too. Glad you caught those leaks. I’ve heard some nightmare stories about hydraulic lines bursting! This leak was really more dampness on the outside of the hose rather than a leak but my take is if I keep everyting dry, then I see most problems early. And, if I see problems early, we are much less likely to get one of the big hydraulic problems you have heard about. I suppose A blown line can come from nowhere but we try to catch as many potential issues as we can early before they have a chance to develop into a big problems later.